I purchased the VIVIX several months ago and have taken maybe three teaspoons here and there but none since late last winter. I just had no problem with growing older and besides, I was in pretty good health. 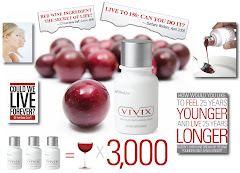 After receiving a copy of the VIVIX testimonials I thought maybe I should try it seriously. I started around the 10th of September. While cleaning paint from under my fingernails one evening about a week later, I thought the my fingers looked more elongated, but thought I was imagining it. But every evening as I sat down to read I would look at my hands and think not. The joints in my fingers have been enlarged for several years now. I have taken the Joint Health Complex and Pain Relief regularly and never really had pain issues. After about two weeks I was sure something was happening because of the VIVIX. I had not mentioned anything to anyone, but at Sunday dinner I put my hands on the table in front of my husband and told him what I was seeing. The elongated appearance had come from the swelling going down on the tops of my fingers. But additionally the swelling was receding at the sides of the joints. The middle joint of my little finger on my right hand has been much more enlarged than the other joints. It is still out of proportion to other joints, but the swelling reduction is huge. The most visible reductions happened with the first month. The joints on my left hand are almost returned to normal. One of the fingers on my right hand looks funny now because the swelling is going down in an uneven manner, and the joints are looking a little crooked. Do I care?? Not!! I proudly tell everyone I see. My husband and I attended a luncheon a couple of weeks after I had started taking VIVIX. One of the ladies attending mentioned that I looked so young. People have said this before to be polite. But she later came over to our table and said to me, ?I?m not kidding, you do look younger.? So I started looking in the mirror. I wear turtle necks all winter and each spring I look in the mirror and gasp. But now I looked and the lower lines at my neck are continually diminishing. When visiting my sister that weekend, she looked at me and said, ?Your jowls are gone. Another unusual effect has been that I am hungry!!! For years I have taken my supplements with a large glass of orange juice; then eat an early dinner around 3:30-4:00 pm. By 11:00 am I am starved and eating something. But?I am not gaining any weight. Thank goodness!! Besides this a couple of large age spots are diminishing slowly. And I am also seeing dark roots in my hair where only white has come in for several years. My skin is changing as well; much silkier. And my hair has become very silky. I am not a vain person so these last visible results alone would not have been a reason for me to use VIVIX. But these in combination with the joint results have surprised me beyond anything I could have imagined. Not to mention what all is going on inside where it is not visible. I have used many Shaklee supplements for approximately 28 years and know I am healthy because of that. But I have to say VIVIX really tops it all for me.